Wings for the Maharaja’s dream? It was an experience to remember. Air India’s 787-Dreamliner on June 9, flew on a milestone journey. It was the launch of the Dreamliner in the UK and it also marked completion of 65 years of the carrier’s journey from London to New Delhi. Looking to revive the national carrier’s fortunes, in face of the cutting-edge competition, the fleet of Dreamliners is supposed to give a fillip to the airline’s efforts to face challenges in the skies. In a rainy day have you ever felt embarrassed to see your grubby umbrella stand next to a set of very elegant ones in the office? Ever encountered that awkward moment when your umbrella flipped in a strong gust of wind and rain? Many of us have experienced such moments and hoped that we had better umbrellas. At 22, Medhavi Gandhi dreamt of reviving India's dying arts and crafts. Armed with an MBA degree, practically no capital and a blazing ambition to market and represent Indian artisans around the globe she started Happy Hands foundation. "At first, I did not even know how many types of arts or crafts our country had. It was an experience to remember. Air India’s 787-Dreamliner on June 9, flew on a milestone journey. It was the launch of the Dreamliner in the UK and it also marked completion of 65 years of the carrier’s journey from London to New Delhi. Looking to revive the national carrier’s fortunes, in face of the cutting-edge competition, the fleet of Dreamliners is supposed to give a fillip to the airline’s efforts to face challenges in the skies. The Dreamliner is supposed to shore up the national carrier’s revenues and be a gamechanger. There is a feeling of space as you enter the B-787, through a beautiful, dramatic entry arch. The feel of spaciousness is enhanced by the decorative ceiling, wider seats and aisles. The wing, tail, nose and flight deck windows of the Dreamliner have been engineered for aerodynamic efficiency. The bigger windows, 18-inch, (the largest in any commercial airplane flying today) provide a sense of openness and natural light. The lighting is electronically dimmable so that passengers can adjust the level required at the push of a button, adjusting the lighting from light to the darkest shade takes only 60 seconds. 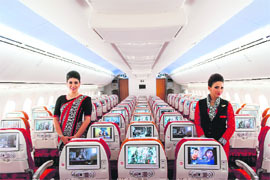 Configured to accommodate 256 seats, 18 business class, flat-bed seats and 238 in the economy class. More leg space is a boon even for the economy class passengers, while the business class can revel in the comfortable travel. The food and service aboard the aircraft were good and for all those aboard, including the 46 journalists from all over the country and AI India officials, it was a pleasant experience. It is being pitted as a game changer because of the numerous defining features that give it an edge over other aircraft. The air, inside too, is cleaner since the 787 system includes a high-efficiency particulate air filter to remove bacteria, odours, irritants and dryness. The Dreamliner is also quieter, cleaner and designed for the environment. It produces 20 per cent fewer emissions than similarly sized planes. Fewer hazardous materials used in its designing makes it eco-friendly and enables composite recycling. It is fuel effiicient and can enable the carrier to open up newer routes and build capacity to tap new markets as well as optimise the load on the existing routes. The cabin environment has lesser pressure than the pressure outside. The cabin is pressured to a maximum of 6,000 feet/1800 metre compared to 8,000 feet/2400 metre feet for other aircraft. Testing shows passengers experience fewer headaches as more oxygen is absorbed into the blood. It is also quieter as it senses turbulence and commands wing control to counter it. The landing and take off are smoother. A lower fuel cost (about 20 per cent less) and a reduced cost of maintenance would give the first-mover advantage to Air India and help it to expand frontiers and open up newer routes. 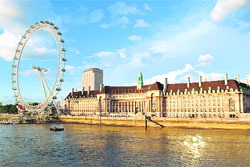 There are already plans to expand the network with flights to Milan, Rome, Moscow, Melbourne, Sydney and Birmingham. That is true of a majority of passengers. Whatever the specifications and the defining features and the USP of the aircraft, the product has to be backed by service that measures up to the claims. With the patriotic pitch not as relevant as it was in the pre-liberalisation era, the national carrier has to think of ways and means to gear up to face competition. These have become all the more daunting after the increase in foreign investment in the civil aviation sector. With the Rs 2,058 crore Jet-Etihad deal (the biggest ever deal) on the cards and Air Asia gearing up to occupy a larger slice of a pie in the sky, Air India has a reason to worry about garnering profits and remaining in the game profitably. For Air India’s mascot, the inimitable Maharaja, charming with his crimson regalia, bow and smile, to be the king of the skies, (and laugh all the way to the bank), a majority of aviation experts say, the bureaucratic culture would have to be replaced by a lean and mean cost-effective structure. It is this that will give it the wherewithal to take on its opponents with a killer instinct and not the laid-back, approach. On time performance, passenger load factor, market share and customer satisfaction index have to be shored up consistently if the Maharaja’s dreams are to be translated into reality. Buying a ‘dream’ carrier is only the beginning, making it work to face hard-nosed reality is an uphill task. In earlier times during monsoons, the last priority was style. After all, an umbrella was only meant to be tough and durable and protect you from the elements. Whoever cared about how it looked? When the rainy season arrived, the old and weather-beaten umbrella (quite literally) was pulled out and dusted and was ready to be used again. Look how times change. Today, an umbrella has become a fashion accessory, which is stylish first and functional later. Leading brands though are offering both — those that are, at once, chic and hardy. Trends are fast changing with a wide range of umbrellas in different colours, shapes and styles arriving in the market. As in couture, monsoon heralds its own fashion and selecting an umbrella that goes with the outfit and one’s personality is a new-age priority. Choosing the right kind of rain protection gear is becoming very important for trendy people. Previously limited only to the dowdy black brolly made of polyester and supported by an aluminium frame, many designer umbrellas today are works of art. There are umbrellas shaped like clouds, others designed as a bouquet of flowers, as pagodas, butterflies, etc. Then, there are colourful umbrellas that come with funky prints to brighten up gloomy, grey days with a hint of pizazz. World’s leading fashion houses like Emporio Armani, Gucci, Burberry, Balenciaga, Bvlgari, Christian Dior, Polo Ralph Lauren and others bring out designer collections season after season and fashionistas think nothing of spending a small fortune to snap them up. Italian luxury brand Billionaire Couture’s 2013 collection includes a crocodile skin umbrella that costs an eye-watering $50,000 (Rs 27.50 lakh). The Indian umbrella industry, too, is undergoing dramatic changes. A number of companies have started making designer umbrellas in the past few years. The segment is dominated by emerging players like Popy, which is one of India’s largest umbrella manufacturers’ accounting for more than 2.5 million umbrellas a year made in its factory in Alappuzha in Kerala. Blending craftsmanship with style, the company is busy putting the trendy umbrella in the wardrobe of well-heeled Indians by making it a lifestyle product. Popy is not alone and the choices are enormous. Online fashion retailer indiacircus.com, too, has unveiled a collection of umbrellas in rainbow colours and prints this season. Its Jalebi umbrella series features various icons of the Indian cityscape, from bicycles and rickshaws to grandiose monuments and in essence captures the quintessential emblems of life in India. The Neo Nawab collection, too, is enigmatic as it resurrects the glory of the Mughal era. There are also the colourful Tamara and Kuheli collections. Most of these umbrellas are priced at Rs 1,299. Then, there is the 150-year-old Ebrahim Currim & Sons, which claims to have ‘taught the people of India to switch from palm leaves to umbrellas’. Its Stag brand of umbrellas has been popular ever since it set up its unit in 1860. Today, it has facilities in Mumbai, Chennai and Calicut and makes umbrellas in a variety of styles, colours and designs. Like Ebrahim Currim & Sons, the Sun brand of umbrellas, too, has been in the business for more than 125 years. Its factory at Mysore has a capacity of manufacturing 1,20,000 umbrellas a month. Though it makes umbrellas for men, women and for promotional purposes, it’s children’s brands like Kandy, Jadoo, Robo, Twinkle, Diamond and Cool Kids are particularly popular with children. In the last few years, the Indian umbrella industry has grown at an unprecedented rate attracting many other players like Delhi Tirpal House, Mumbai-based Paras Umbrella Factory, Pune-based Anchor Umbrellas and Leo Umbrella Industries in Rajasthan. To the advantage of the Indian buyer, the entire market has been divided into two main segments — premium and economy, of which the latter accounts for a big part of the customer’s wallet. While companies like Popy, Sun and Ebrahim Currim have a major share of the umbrella pie, ironically these players cannot rest easy as their biggest challenge comes from the unorganised sector, especially in the economy section at eminently affordable prices ranging from a low of Rs 50 to Rs 200 though with hardly any degree of guarantee and durability. Interestingly none of the well-known overseas brands like Haas-Jordan, Cloud9, Windbrella, Fulton, Burberry Lisbeth Dahl and others have entered India though there are reports that some of them are seriously considering setting shop looking at the burgeoning demand. Once they make an entry, there will be an abundance of options for the Indian consumers. As of now, there is more than enough for everyone in the economy section. However, the big fight is emerging in the premium section where the umbrella has ceased to be just a commodity and has transformed into an ‘aspirational’ product with fashion, style and elegance fast becoming as important as sturdiness and safety for the globetrotting Indian. This collection of umbrellas by Danish brand Lisbeth Dahl is simply gorgeous with its flower-shaped canopy, wooden crook handle, stem, top ferrule and spoke tips. 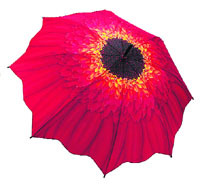 These flower umbrellas are 35 inches in diameter with 41 inch canopy width and add to the fashion quotient of a lady. The stunning duck handle umbrellas from Burberry are a high fashion statement. Though these can be used for protection against the elements, people prefer to use these as stylish walking stiks. Handcrafted and painted, these heirloom pieces encompass unique character of their own. 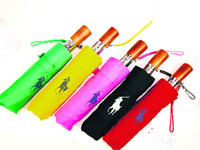 Screen-printed with the Ralph Lauren iconic Big Pony logo, these compact umbrellas in different colours, with a matching case, make a bold fashion statement. A percentage of sales from all Pink Pony umbrellas supports programmes for cancer screening, treatment and research. Stand out in a sea of black with London Undercover’s bright orange umbrella. With a bamboo cane handle that makes it look like a walking stick when the weather clears up, this foldable umbrella fuses practicality with flair. Best of all, it is compact enough to fit in a briefcase or bag. The compact black umbrella from Emporio Armani is just the right size to fit into a handbag or a briefcase. Each panel features a subtle black logo and a contrast white trim logo at the bottom. The wooden handle has a carved Armani eagle logo and features a quick release button. This canopy umbrella is an all-year-round accessory that provides protection from rain and is also a walking companion. It features a double canopy allowing the wind to pass through the umbrella without turning it inside out. The handle is ergonomically designed to reduce hand fatigue. This is a portable folding umbrella that will turn heads as you stroll through the rain. The 42-inch diameter umbrella by American company Tray 6 combines fashion and functionality and will protect you from the hardest of rains while adding an element of style to your personality. The Gucci self-folding umbrella is made of nylon fabric with beige and ebony trim. It has nickel metal accessories and a wooden handle with press stud fasten function. The Gucci logo is embossed prominently and the 42-inch diameter umbrella comes with a smart branded cover. Spanish fashion house Balenciaga gives a new spin to the shape of the umbrella. According to the company, the large square shape of the umbrella gives better protection than a conventional one. It has a metal logo detailing, long ferrule, bottom spring and a velcro fastening. Kidorable has transformed the umbrella into beautiful natural objects. This colourful butterfly umbrella has the appearance of a butterfly springing to life with wings that pop out with an antennae. It has a curved plastic handle, steel shaft and frame and is child-sized for those little hands. 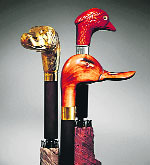 British company Browning is known for its umbrellas, which are popular with people who go fishing. The large, burgundy fishing umbrella in conventional design is PVC-coated and secures the user against the vagaries of the weather especially during fishing trips to the river or sea. Shield yourself against the elements this monsoon with this stylish Marc by Marc Jacobs’ umbrella. The jumbled birds umbrella features bird graphics and a bird-shaped handle. It can be carried by the handy strap or fitted in a handbag. The playful design will bring an instant pop of colour to the rainy days. This classic golf umbrella features a deluxe wood shaft and crafted wood handle. This sturdy umbrella also stands up in strong gusts on a golf course due to its double-ribbed unichrome plated steel frame and windproof design that can be easily reversed if blown inside out. At 22, Medhavi Gandhi dreamt of reviving India's dying arts and crafts. Armed with an MBA degree, practically no capital and a blazing ambition to market and represent Indian artisans around the globe she started Happy Hands foundation. "At first, I did not even know how many types of arts or crafts our country had. As an intern for Unesco, when I interacted with the artisans to document their works, I could not resist the beauty and the legends attached with these crafts," says the young entrepreneur. Three years later, her foundation is working with 800 artisan families and covers 25 clusters and villages across 12 states in India. What motivated her to work on behalf of uneducated artists from various parts of rural India? "I could see simplicity and grace in a handmade product, a story waiting to be told, an art dying to be appreciated … I knew there was a large audience waiting to hear these stories." Interestingly, for Medhavi, her first volunteers and customers were her friends and acquaintances who, unaware of our rich cultural heritage, were "too busy graduating or getting jobs". She travelled to villages to gather artisans. With no capital in hand, she had to convince them to lend her their artifacts, which she would later sell at a good price and soon enough they started trusting her. "People who could be of help were dismissive of the idea, of how 22-year olds could change a tradition; and education wasn't even considered an issue. But for every one non-supportive person we met five supportive ones and that way I think I was lucky," she says. Today, Happy Hands foundation markets, arts and crafts as unique and unheard of as sujini, dhokra, cheriyal, bidri, jadu patua and sikki grass. They have reached out to youngsters and made them aware of India's vast heritage. 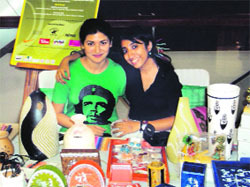 Medhavi explored and successfully introduced artisan products for corporate gifting. "Traditional art works speak of stories, customs and rituals but sadly year in and year out they spoke of the same episode from the Ramayana or the Mahabharata. Our cultural heritage, though vast, hardly saw representation in art," she says. She drew inspiration from artists abroad. Her foundation is helping Indian artists imbibe more through international exchange programmes. "I see artists coming up with better designs and more so, I see the public accepting those designs," says Gandhi. Many artisans have been inspired to set-up their own enterprises and sell their products online to international connoisseurs. Was it scary to start on her own at the tender age of 22? Pat comes the reply "The very age of 22 was the best thing about starting on my own. I had nothing to lose and at worst, my venture stood the risk of not working out. Then I had the Plan B of taking up a job but so as I never have to look at Plan B, I worked harder and harder and my to-do list grew longer," she concludes. Home security is top priority in today's risk-prone world. Techno-savvy thieves are known to prise open even the safest locks exposing homeowners to extreme danger. But for once it would appear newage lock makers are a step ahead of burglars thanks to digital technology. 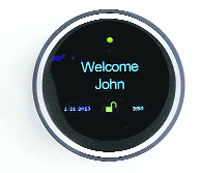 American company Goji is launching a new Wi-Fi- and Bluetooth-enabled lock that clicks a picture of the person trying to open the door and sends an alert message to the owner's phone alongwith the photograph. With devices like Goji locks, it may be time to forget security guards. It is these little IT-enabled gadgets that are going to be your real saviours in the future. Ever groped in the dark to find a drink of your choice from an ice box? Many of us have and have also cursed the unlighted conditions were it becomes a challenge to find the right beverage. One usually ends up with frozen fingers and a wrong brand of brew. 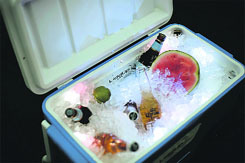 American company LiddUp is changing all that with its new cooler that has built-in LED lighting to conveniently illuminate its interior contents very much the way it happens with a refrigerator which lights up when you open it. Best of all it has a handle, wheels and cup holders to make your picnic as much fun as possible. Remember the good old Vespa-the preferred two wheeler of middle class families? No matter how uncomfortable it was to sit on it and drive it to one's destination, back in the 1960s and 1970s it commanded a premium and was often the object of envy. Well, it may no longer be uncomfortable to sit on and it will still be the owner's pride if you own one-or rather a piece of it. 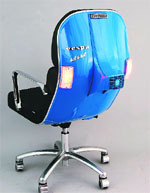 A Spanish design company Bel & Bel has turned the Vespa into a stylish swivel office chair. Original Vespa frames are padded and upholstered with leather to create beautiful retro chairs with functional flashing lights. You may have gotten ahead in life but you can still go back to your roots by riding…or rather sitting…on a Vespa chair in office. Most of us use laptops--the normal branded ones that come packaged with standard software. But how do high rollers differentiate themselves when they want to go digital? Simple, they use the millionaire's laptop! London-based luxury computer manufacturer Luvaglio has introduced the Million Dollar Laptop which distinguishes the mega rich from the hoi polloi. It has a 17" LED widescreen, 128 GB disk space and a built-in Blu-Ray drive. Nothing unusual, you'd say. But here's the difference. The company allows customers to choose precious stones to top up the laptop including a rare coloured diamond, which doubles as a power button. It's a device that teaches kids essential skills with the help of electronics. 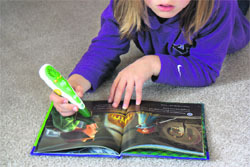 The Leap Reader is a pen-like gadget that works interactively with books to teach literacy skills to young learners. It is compatible with specially printed books and teaches children not only how to recognise and say letters or words but also how to write them. When a kid touches any letter or word in one of these special books with the tip of the Leap Reader pen he or she will hear an audio on how it is pronounced. It also encourages children to trace the lines of letters and then try writing on their own. The device is guaranteed to provide loads of fun. That Swiss luxury brand Chopard is one of the world's leading jewellers is well known. 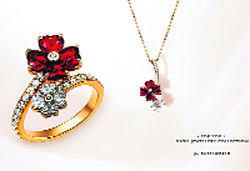 What is not so well known is that its jewellery has magical powers. Hard to believe it? Just check out Chopard's stunning new range called For You. It is talisman jewellery adorned with precious stones and intended to bring good fortune and love. Wearing a four-leaf clover is believed to be a token of good luck, and when it is presented by a loved one it becomes a true talisman. The heart shaped stones are set in groups of four and highlighted with a round diamond in the centre giving it a truly magical effect. Single Malt. The name conjures up magic among whiskey lovers many of whom are said to suffer from malt mania. The eternal debate revolves around the quality of the ambrosia. 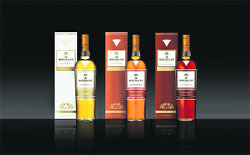 Which is the best Single Malt available in the market-Ardbeg, Talisker, Glenmorangie or a Macallan? Many connoisseurs consider Macallan to be the grand emperor. And what should be the age of this whiskey? You wouldn't have to worry about that if you buy the Macallan 1824 set of three bottles-Gold, Sienna and Ruby. The company has done away with age on this collection and uses colours to indicate a differentiation. The unprecedented step is seen as a way of shattering the notion that with age malt gets better. The new thinking is: What's age got to do with it! What happens when a luxury champagne brand collaborates with an iconic designer? 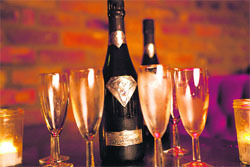 The result is the Taste of Diamonds, the world most expensive champagne ever. French wine maker Goût de Diamants invited London-based designer Alexander Amosu to create a champagne bottle to beat all champagne bottles. He has come up with a one-off bottle design which has taken its inspiration from the Superman insignia. It is hand crafted from 18ct solid white gold embedded with a single flawless deep cut white diamond weighing 19carats. The label is also in 18carat gold, handcrafted and engraved with the undisclosed client's name who, needless to say, must be among the wealthiest people in the world! Sixty years ago two men scripted one of the greatest triumphs of human spirit against overwhelming odds. New Zealander Edmund Hillary and Sherpa Tenzing Norgay conquered Mount Everest which till then WAS thought to be insurmountable. Tenzing took his final steps to the Everest in a pair of Bally Reindeer-Himalaya boots. Six decades later, today, seizing the moment the Swiss brand Bally has unveiled its exclusive Everest collection complete with a modern remake of Tenzing's boots, fur-lined leather hat, outerwear and hoods with detachable marmot fur trimmings. 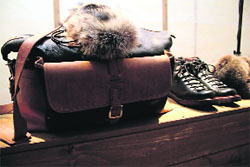 The collection to be out in the stores soon is designed to awaken the adventurous spirit in you. The audience included celebrities like Sharon Stone, Goldie Hawn, Janet Jackson, Milla Jovovich, Heidi Klum, Kylie Minogue and Nicole Kidman. They had all come to watch with awe the resplendent collection of Tarun Tahiliani as he showcased his unique creations in gold, at the Ultimate Gold Collection Fashion Show as a part of the prestigious annual amfAR benefit at Festival de Cannes, 2013 in France. For his spectacular runway presentation Tahiliani had designed two gold themed outfits along with some splendid gold jewellery which were displayed on the ramp by American supermodel Karlie Kloss. The creations are to be auctioned and the proceeds will go towards AIDS research.